The Big Red Bag is finally done! This is made from the thrift store red sweater. It was a thoroughly satisfying experience overall; from ripping it apart to making something new. The bag, before. The strip of metal is a six inch ruler. From the side, you can see the diagonal seams across the base; it’s a square, knitted in the round. The shape looks very baggy, though – it shapes up some later on. It shrunk up pretty fast! It was maybe ten or twelve minutes of agitation. Note for future reference: this red bleeds, a lot. My felting pillowcase is now pink. This is the blocking. I didn’t have anything quite the right shape, so had to improvise; this is two twelve-pack soda cases up on their ends, and a notebook. This is the finished product, with the buttons and all. I think it looks really sharp. This is how it opens; it’s thick and sturdy enough that it sits upright when open. The way the cord is run through helps a little, too. Chris again, and Taco the Dog. ok, i see you said it was “felted” – please explain..
it looked like a knit bag & then it looked all fuzzy and soft after you washed it. what’dya do? i seriously like this. is it soft & fuzzy or slightly scratchy? it looks like it would make a very cool hat. It’s called fulling, actually, but everybody these days calls it felting. You knit large and loose, and then shrink it up by running it through the clothes washer in hot water with detergent. The agitation makes the fibers mat up and it gets thick and small. It’s not exactly “baby-soft fuzzy” – but it’s definitely not scratchy. It’s still wool, which always feels to me a little scratchy for, say, bedsheets, but fine for a warm hat or sweater. In its prior incarnation, it was a really nice Abercrombie & Fitch sweater that I got at a thrift shop. i’m not a big fan of wool – i grew up in warm climates & have sensory issues when it comes to scratchy. seriously liking how it looks. i’m in the process of screwing up the nerve to make a bag, but yours exceeds anything i’m ready to try. Oh, it’s not tough at all! I kept being intimidated by the idea of spending so much on yarn (all the patterns seem to call for ten-dollars-a-skein Japanese Noro), but once I got a two-pound thrift-store sweater for six bucks and turned it into yarn, that concern just evaporated! 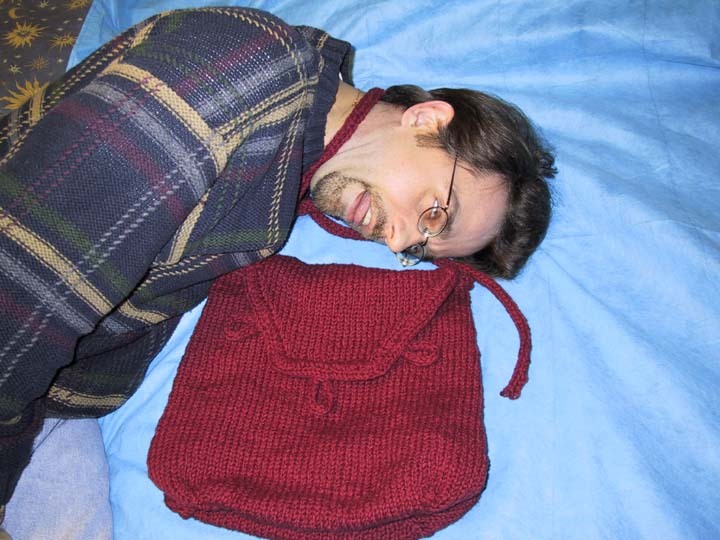 I’m *so* loving knitting. I’ve never done it before much – taught myself kinda about five years ago, but I got back from Peru in October, it was like a fire in my brain… it’s so satisfying. no way! you grew up in Houston as well? I was in the Southwest area. My childhood home was close to Fondren Rd and US-59/Main St. in the Westbury area. I went to Fondren Jr. High and should have went to Westbury but opt to go to a magnet school program. Engineering Professions. It was located close to Yale and 635. Once I was out of college and back in Houston, most of the apartments I lived in were near Westheimer and Gessner. I’ve been in Dallas since ’91. I was way north – my parents bought a house just outside Kingwood (Forest Cove) in 1975, and I lived there until I went to college at U of Houston (1988, graduated 1993). I moved to Abilene for a year (lived on base with an army man and his wife – one big bed. Whee!) and then moved to Dallas in 94. Been here in Farmers Branch since then. Wow! Very cool. Impressive work. Your bag is beautiful! It looks like it has taken quit a bit of time to make. You are very talented. I have some projects I need to finish, and I will as soon as there is time. I crochet, I taught myself to knit once upon a time, but I was pretty young and have since forgotten. I think my next project to start is to learn to knit again, I don’t remember it being too terribly hard. *by the way, your dog is adorable! I love dogs, I have a 4 month old chewing machine of my own and I love her very much, even if Lobo tells her different, lol. Lovely and functional! And I like the pictures with chris & Taco. T’anks! It was a lot of fun to do. I’m having SO MUCH fun doing the felted knitting.